Purina Veterinary Diets EN Fiber Balance For Dogs 18lb bag. Purina Veterinary Diets DCO canine formula provides complete and balanced nutrition for maintenance of the adult dog. 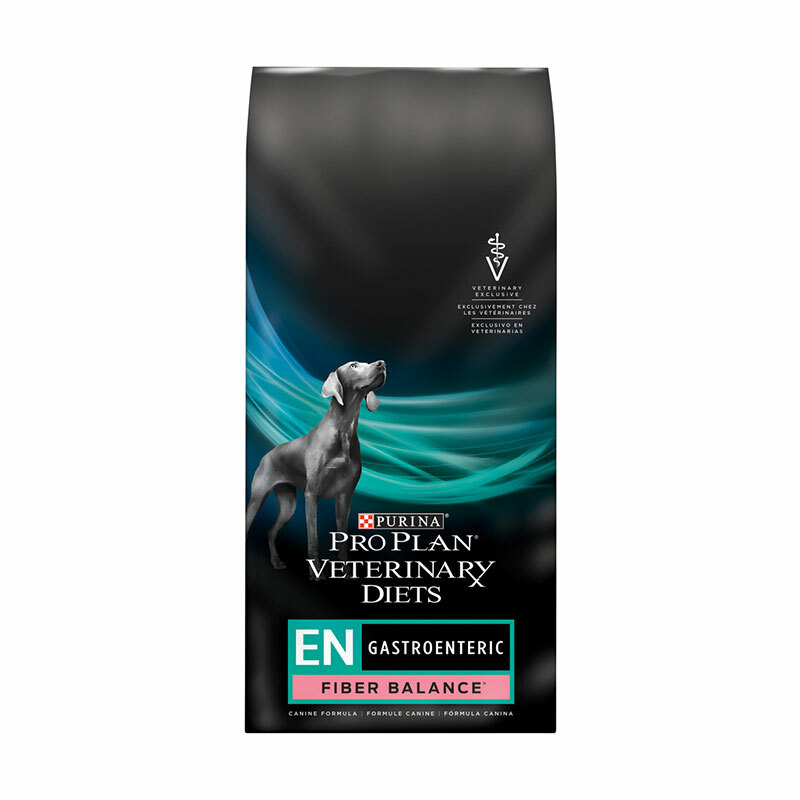 Purina Veterinary Diets EN Fiber Balance (Formally DCO Fiber Control) canine formula provides complete and balanced nutrition for maintenance of the adult dog and has been formulated to achieve the optimal level of fiber to help instestinal motility. This blend of soluble and soluble fiber dog food helps support your dogs GI tract. EN Fiber Blanace contains the prebiotic aleurone that helps nourish beneficial microflora. The following feeding program is recommended as a guideline only. With your veterinarian's approval, offer increasing amounts of the new food with decreasing amounts of the old food. Ingredients: Whole grain corn, dried beet pulp (15% - A source of fiber), poultry by-product meal, corn gluten meal, pearled barley, animal fat preserved with mixed-tocopherols, pea fiber, animal digest, mono and dicalcium phosphate, wheat bran, dried whey, calcium, carbonate, potassium chloride, salt, fish oil, L-Lysine monohydrochloride, Vitamin E supplement, choline chloride, zinc sulfate, ferrous sulfate, niacin, manganese sulfate, Vitamin A supplement, calcium pantothenate, thiamine monoitrate, Vitamin B-12 supplement, copper sulfate, riboflavin supplement, pyridoxine, hydrochloride, folic acid, menadione sodium bisulfite complex, Vitamin D-3 supplement, calcium iodate, biotin, sodium selenite.